From left, Barbara Potter, Jenelle Potter and Jamie Curd. JONESBOROUGH, Tenn. -- Testimony has begun in a double-murder trial for a case prosecutors say was caused by a woman being deleted as a friend on Facebook. Testimony began Monday for 64-year-old Barbara Potter and her daughter, 35-year-old Jenelle Potter, both of Mountain City. The two are charged with the 2012 shooting deaths of 36-year-old Billy Payne and 23-year-old Billie Jean Hayworth, who were found inside their home. Their 7-month-old son, covered in blood, was found in the home alive. 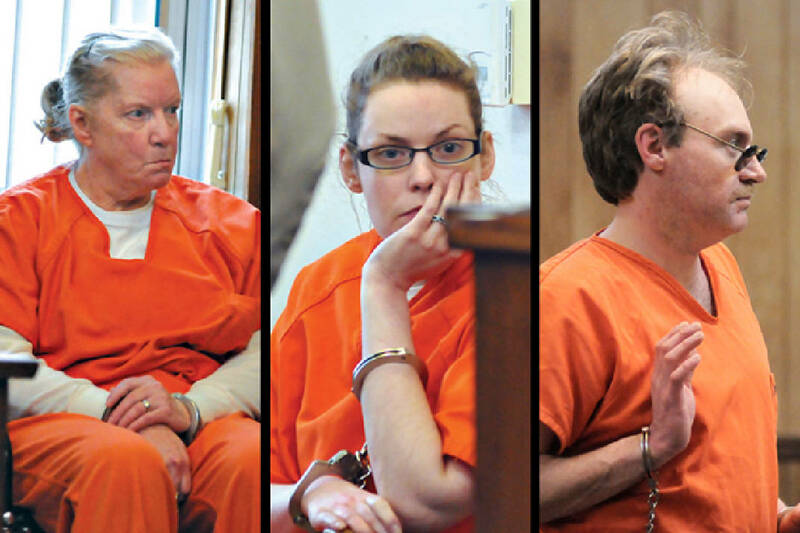 The Johnson City Press reports that two other defendants, Marvin Potter and Jamie Curd, are also charged with murder. Marvin Potter, Jenelle Potter's father, is already serving two life sentences for the slayings. Curd has reached a plea agreement. Assistant District Attorney General Dennis Brooks said the killings happened after Jenelle Potter was "unfriended" by the couple on Facebook. During opening statements, Brooks set the stage for the killings, which he said were based on threats Jenelle Potter had created. Brooks described her as a bored, lonely 30-something. Brooks said Jenelle Porter created several online personas. He said hundreds of emails from the Potter's family computer "spewing hate" toward Hayworth were discovered. Brooks said prosecutors intend to present more than 200 pages of emails and Facebook page printouts during trial. Prosecutors presented testimony from six witnesses in the case, including Tennessee Bureau of Investigation Agent Scott Lott. Lott told the jury the big break in the case came about a week after the killings when Curd admitted to investigators he participated in the murders, implicating Marvin Potter as well. If convicted, both Potter women could face life in prison.